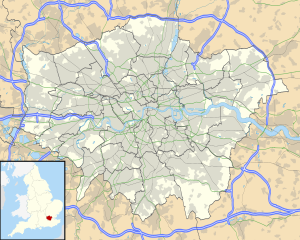 ^ London Heathrow airport – Economic and social impact. Ecquants. [7 September 2013]. （原始内容存档于2013年11月3日）. ^ 2.0 2.1 London Heathrow – EGLL. NATS Aeronautical Information Service. [2011-04-21]. ^ UK Airport Statistics: 2007 - annual. Civil Aviation Authority. [2009-01-05]. ^ Terminal 5 second satellite building due to open in 2010. BBC News. 2008-03-11 [2008-03-27]. ^ Debut A380 flight lands in London. BBC News. 2008-03-18 [2008-03-19]. 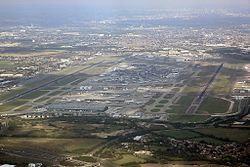 ^ Heathrow submits third runway options to Davies Commission. BBC News. 17 July 2013 [25 December 2015]. 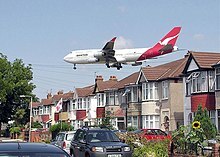 ^ Heathrow runway decision delayed – and no one is happy about it. 11 December 2015 [25 December 2015]. ^ Heathrow Terminal One deserted ahead of closure next month. ITV News. 28 May 2015 [1 July 2015].